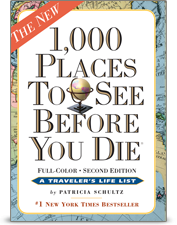 So….I don’t know if you have been living under a rock somewhere, but if not, you have probably heard of Patricia Schultz’s 1000 Places to See Before You Die. This iconic travel bible was my inspiration for travel/life lists and I LOVE it! I keep tabs with the dates for each place I have visited. I have been known to keep in the back seat of my car…because you just never know when the opportunity for adventure may arise.